Victoria Woodridge, student in the master’s of music program at California Baptist University, remembers growing up listening to her older sister play the piano and knowing she wanted to do the same. Starting at 8 years old, Woodridge said she has always found herself at home when she lays her fingers on the black and white keys of a piano. 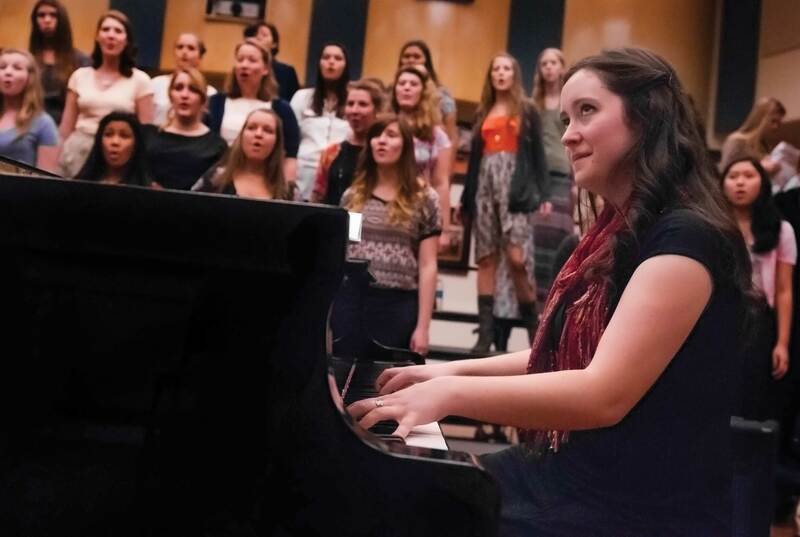 Over the past seven years, Woodridge has contributed her musical talents to The Collinsworth School of Music at CBU. Accompanying both New Song and Women’s Choir has challenged Woodridge as an artist and helped make her the pianist she is today. Woodridge can often be found in the practice rooms of the Hawkins Music Building. Fellow Women’s Choir member Gabrielle Green, sophomore theater major, said Woodridge’s passion for her craft is obvious every time she sits down at the piano. Woodridge was the pianist for New Song for the first five years of the choir’s history. Having the opportunity to watch the group grow, develop and adjust to different directors made for a bittersweet transition last year when she switched over to accompany Women’s Choir. After receiving her bachelor of arts degree in piano performance and composition in 2011, Woodridge continued to further her musical studies and is now in the midst of the final semester of her master’s degree. She has already dedicated hours of preparation for her final performance even though the recital will not be for another three months. “It depends on the day, but I will spend anywhere from 3 to 5 hours a day practicing for that performance,” Woodridge said. In May, Woodridge will have her final recital at CBU, where her months of preparation will be put to the test as she performs an hour-long memorized set to share with the audience. This will mark the completion of her master’s degree and farewell to the CBU music family. Not limiting herself to CBU, Woodridge has played for weddings, churches and musical theater productions. Her love for music drives her involvement at different musical venues that allow her to both challenge and share her skills. Because of its length, musical theater provides challenges that push Woodridge as an artist in ways that weddings and church recitals simply cannot. Even after years of piano lessons and hours of practice, Woodridge said she still loves to get lost in the music. She said she is excited to see where music will take her and knows she will always find joy at a piano.